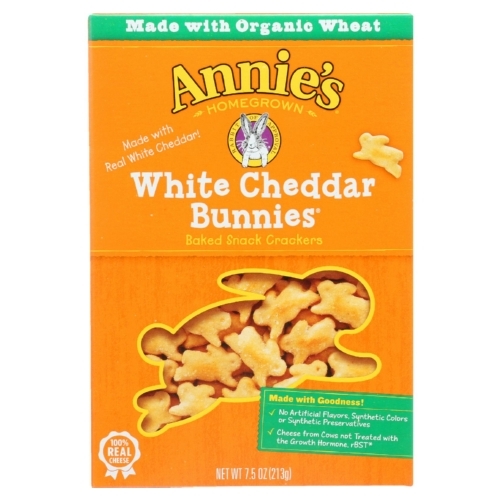 Made with the same real aged white cheddar cheese as used on our beloved Purple Box Mac and Cheese, Annie�s White Cheddar Bunnies are simply irresistible. Also available in a 6oz resealable bag at certain retail locations. Ingredients: ORGANIC WHOLE WHEAT FLOUR, ORGANIC WHEAT FLOUR, EXPELLER-PRESSED SUNFLOWER OIL, SALT, YEAST, CHEDDAR CHEESE (CULTURED PASTEURIZED MILK, SALT, ENZYMES), CULTURED WHOLE MILK, NONFAT MILK, GROUND CELERY SEED, ONION POWDER, NATURAL VITAMIN E TO PROTECT FLAVOR.CONTAINS MILK AND WHEAT INGREDIENTS.MADE ON SHARED EQUIPMENT THAT ALSO PROCESSES SOY. Ingredients, Nutrition Facts, and Allergen Statements can change. Always refer to the actual package for the most complete and accurate information.